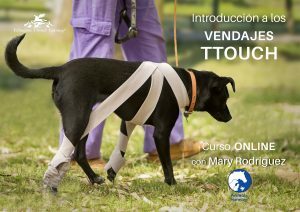 We have just launch ed a new short online course in Spanish where you can learn some simple, basic TTouch wrap configurations. The holiday season is coming soon and for many dogs this is a time of great stress due to fireworks and other noisy events. TTouch wraps can help enormously to remove or reduce the stress involved. By starting now you can lay a solid foundation for your dog’s wellbeing which will go far beyond the immediate situation of holiday fireworks.